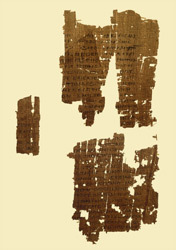 The Egerton Papyrus 2 fragments were among a collection bought by the British Museum in 1934 from a dealer in Egypt. Where they were found is not known for certain, but other items in the collection came from Oxyrhynchus. They are written in Greek on thin sheets made from slices of the reed-like papyrus plant soaked in water, pressed together and then dried. Fragment 2 measures 11.8 x 9.7 cms.